Dedicated to a man who lived in the 19th- 20th century, the Schone Naci Statue is the only Silver statue in Bratislava. The story goes that the man fell in love with a woman who did not love him back. Knowing this, the man would give flowers to random women to make them smile and greet people with kind gestures. After he died, the city decided to keep his smile alive through this statue. A story with a difference, stop by to tell Ignac Lamar (The man’s real name) a warm ‘Hi’! Take a walk through the neighborhood (old town). How popular is Schone Naci Statue? People normally club together Hviezdoslavovo Namestie and Hlavne Namestie while planning their visit to Schone Naci Statue. 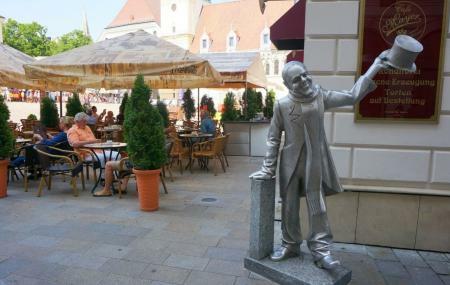 A funny silver statue for a love matter of Ignace Lamar, a local resident situated in the heart of Bratislava city. A quirky statue of Ignac Lamar a local character seen in the city around the beginning of the twentieth century, often in a top hat and tails. He would walk around and greet the ladies with the words "I kiss your hand" in Slovak, German and Hungarian. His grandfather, also named Ignac Lamar, was a clown, the Ignac Lamar in the statue tried to bring happiness as his grandfather had done. Note this statue does move, I have seen it in 3 locations all within 50 metres of each other close to the main square. One of several “fun” statues around the city / this one of a real person though. After the Communist eats, some fun statues were placed around to try to lighten and liven up the city.